Two-storey dwelling with shingled roof. 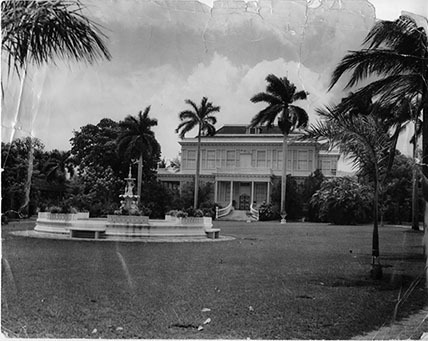 Tall palm trees and a fountain are on the property before the house. “A suburban residence near Kingston, 1958 - Devon House,” National Library of Jamaica Digital Collection , accessed April 20, 2019, https://nljdigital.nlj.gov.jm/items/show/5284.